Be the first to share your favorite memory, photo or story of Mercedes. This memorial page is dedicated for family, friends and future generations to celebrate the life of their loved one. 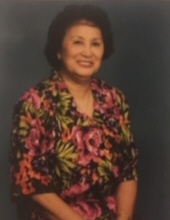 On April 6, 2019, Mercedes Lavarias Acosta, surrounded by her family in Lodi, passed away to join the Lord. Mercedes was born in Balungao, Pangasinan, Philippines on September 24, 1927 to Leonardo and Teodora Lavarias. She is survived by her son, Ray Acosta (Lita), daughter, Delie Bartlett (Jim). Grandchildren Michelle Brassesco (Nick), Jeff Bartlett (Noemi), Jennifer Loper (Mike), Jason Bartlett (Kelly), Valerie Solorzano (Luke), John Acosta (Meah) and Lisa Acosta. Great grandchildren Dominic, Gianni and Lucca Brassesco; Dylan and Kiara Bartlett; Jayden and Jagger Bartlett; Maximo and Mason Loper; Ava and Noah Solorzano. Mercedes was preceded in death by her husband Maximo Acosta, children Adelia and Albert Acosta, sister Encarnacion Meriales, brothers Rafael, Pedro, Emilio, Mariano, Juan, Ernesto and Ignacio Lavarias. Mama Mercy had the heart of a saint. Her love was unconditional, and always worried about others and never herself. She taught her family that love will conquer all; a true example of a child of God. In 91 years of life on this earth, Mama Mercy took care of her family (all 5,732 of them haha). Even in her last breath, she was making sure all the kids were taken care of. We may have lost one of the greatest souls, but heaven is now rejoicing with what they’ve gained. Funeral arrangements by Cusimano Family Colonial Mortuary, 96 W. El Camino Real, Mtn. View, CA, 94040, (650) 968-4453, where visitation and viewing will be held on Sunday, April 14 from 12-9pm; Monday, April 15, 9am-9pm, and the Vigil at 6:00pm Monday. The Funeral Mass will be held on Tuesday, April 16 at 10:30am at St. Athanasius Catholic Church, 160 N. Rengstorff Ave., Mtn. View, followed by interment Alta Mesa Cemetery in Palo Alto. Please sign the guest book at www.lodinews.com/guestbook. To plant a tree in memory of Mercedes Lavarias Acosta, please visit our Tribute Store. "Email Address" would like to share the life celebration of Mercedes Lavarias Acosta. Click on the "link" to go to share a favorite memory or leave a condolence message for the family.